Earith, Erith, co. Huntingdon, 349. Earl Marshal of England, petition referred to, 555. Earl (Earle, Erle), , captain, at the Treasury on business concerning the Constantine, 22. -, , major general, regiment of Foot of, pay of, 257. -, Gyles, Commissary of Stores in Spain, 37, 430, 467. -, John, riding officer at the Isle of Sheppey, 503. -, Thomas, lieutenant general, Expedition [to France] in 1708 and 1709 under, 334; Governor of Portsmouth, 252; Lieutenant General of the Ordnance, 105, 460, 544. Earsby, Thomas, a Commissioner for Licensing Hawkers and Pedlars, 120. Earsham, co. Norfolk, hundred of, Receiver General of Taxes for, 167. Easenhall, Easenhult, co. Warwick, 402. East, George, bricklayer, working in the Savoy Hospital, 439. East Guldeford, East Guilford, co. Sussex, riding officer at, 503. East Ham, co. Essex, 531. East Henault Walk. See Waltham Forest. East India Company, damaged coffee bought of, frauds alleged concerning, 177. -, Fund for 160,000l. per annum (as by 9 Wm. III, c. 25 and 44, and 6 Anne, c. 71), deficiency of, payments towards, 218, 219, 513. -, to attend the Treasury, 13. -, warehouses in London port for tea and coffee imported, Comptroller of. See Booth, J.; Boult, J.; Weekes, C.
East India goods, cargo of pieces of Romalls, Bafts and Byramports, 602. -, duties on (as by 2 Wm. and Mary, Sess. 2, c. 4, and continued by 8 Anne, c. 14, and made perpetual by 9 Anne, c. 15), account of, 9, 126; fraud to escape payment of, 602; received by South Sea Company, 359, 510. -, prohibited, warehouse in London port for, Comptrollers of, 437; warehousekeepers, 495, 533, 585. East Indies, ship from, 126; ship going to, 209. Easthamstead Walk. See Windsor Forest. Eathorpe, Ethorpe, co. Warwick, 401. Eaton, Peter, selling the Vine Tavern in Thames Street, London, 149. Eccles, John, Master of the Music to the Royal Household, 181, 448. 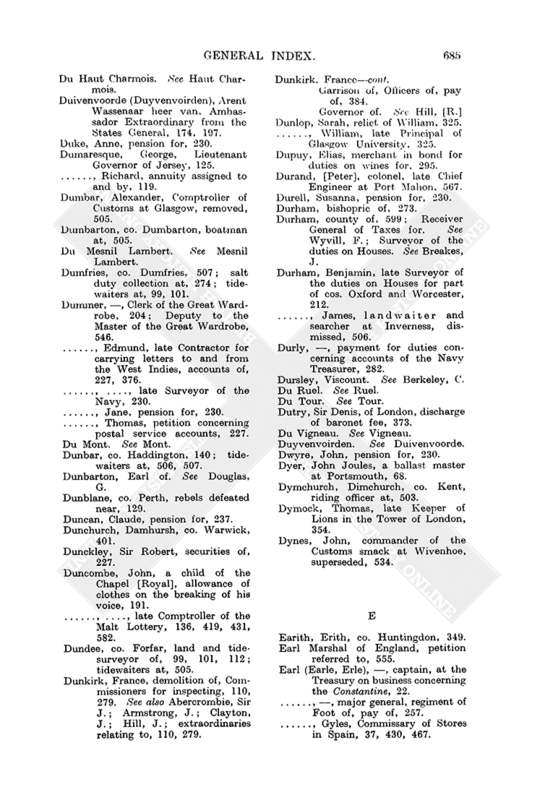 Ecclesiastic History, Professor of, in Glasgow University, 324. Eddystone, Edistone, Lighthouse, building of the, 234. Eden, Anne, pension for, 230. -, Samuel, of Birmingham, a Commissioner to inquire into losses and damages caused by Rebels in co. Warwick, 424. Edge, William, an agent of the Office of Ordnance, 67. Edgebaston, Edgeburton, co. Warwick, 403. 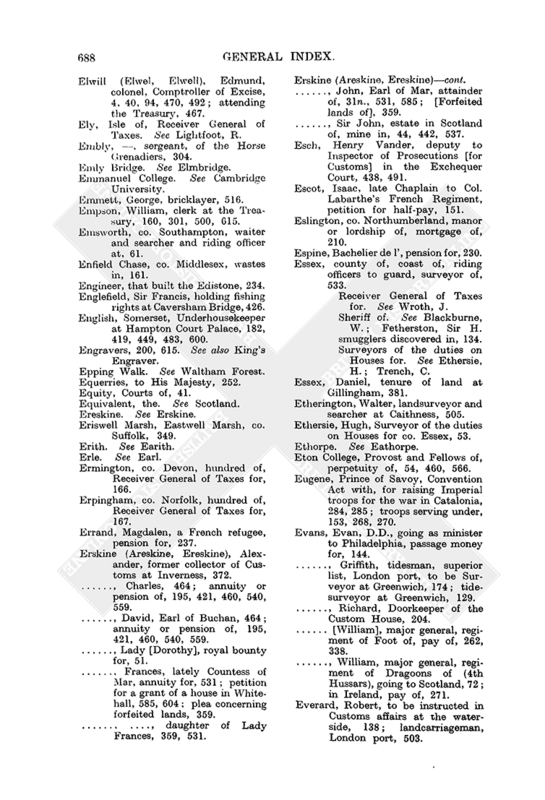 Edgecombe (Edgecumbe), Richard, a Lord of the Treasury, 26, 27, 29, 30, 32, 34, 35, 36, 38, 39, 40, 44, 46, 48, 49, 50; salary, 500, 615. Edgell, William, Inspector of the river of Thames, 324. Edinburgh, co. Edinburgh, 272, 410, 595, 604. -, bill drawn from, 41, 494. -, Castle, necessary woman at, 522; Serjeants and porters at, 523. -, Customs at, Receiver General of, 484. -, defence of, during the Rebellion, account of the charge of levies for, 240. -, distributor of stamped paper, etc., 548, 549. -, Gates of, landcarriagewaiters at, 99, 101, 102, 507. -, houses made fit for the reception of prisoners in, 303. -, letter dated at, 537. -, Lord Justice Clerk at, 6, 101. -, Lord Provost, Magistrates and Town Council of, 240, 464. -, Malt duties for, 220. -, Mint at. See Scotlandmint. -, Salt Office at, 525. -, specie sent to, 171, 304, 305. -, writer in, 46, 571. Edinburgh, Bishop of, annuity of, 587. Edlin, Thomas, merchant, petition concerning brandy and rum, 355. Edstone, Edston, co. Warwick, 424. 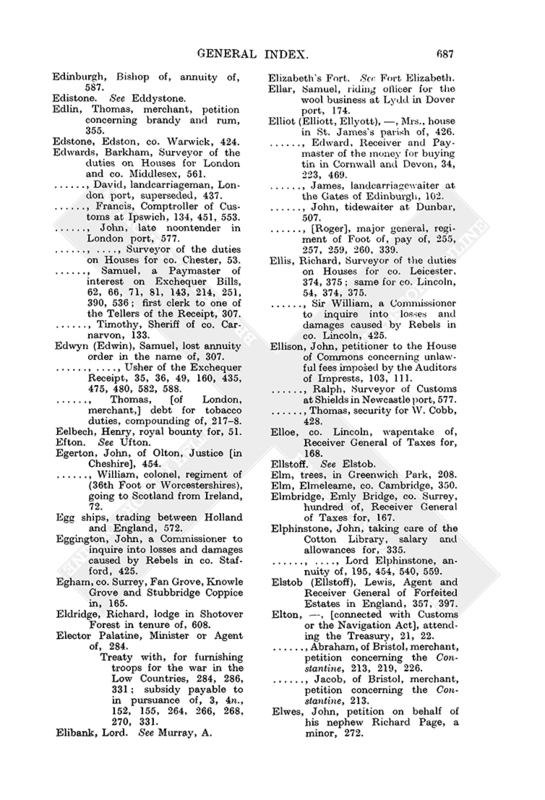 Edwards, Barkham, Surveyor of the duties on Houses for London and co. Middlesex, 561. -, David, landcarriageman, London port, superseded, 437. -, Francis, Comptroller of Customs at Ipswich, 134, 451, 553. -, John, late noontender in London port, 577. -, -, Surveyor of the duties on Houses for co. Chester, 53. -, Samuel, a Paymaster of interest on Exchequer Bills, 62, 66, 71, 81, 143, 214, 251, 390, 536; first clerk to one of the Tellers of the Receipt, 307. -, Timothy, Sheriff of co. Carnarvon, 133. Edwyn (Edwin), Samuel, lost annuity order in the name of, 307. -, -, Usher of the Exchequer Receipt, 35, 36, 49, 160, 435, 475, 480, 582, 588. -, Thomas, [of London, merchant,] debt for tobacco duties, compounding of, 2178. Eelbech, Henry, royal bounty for, 51. Egerton, John, of Olton, Justice [in Cheshire], 454. -, William, colonel, regiment of (36th Foot or Worcestershires), going to Scotland from Ireland, 72. Egg ships, trading between Holland and England, 572. Eggington, John, a Commissioner to inquire into losses and damages caused by Rebels in co. Stafford, 425. Egham, co. Surrey, Fan Grove, Knowle Grove and Stubbridge Coppice in, 165. Eldridge, Richard, lodge in Shotover Forest in tenure of, 608. Elector Palatine, Minister or Agent of, 284. -, Treaty with, for furnishing troops for the war in the Low Countries, 284, 286, 331; subsidy payable to in pursuance of, 3, 4n., 152, 155, 264, 266, 268, 270, 331. Elibank, Lord. See Murray, A.
Elizabeth's Fort. See Fort Elizabeth. Ellar, Samuel, riding officer for the wool business at Lydd in Dover port, 174. Elliot (Elliott, Ellyott), , Mrs., house in St. James's parish of, 426. -, Edward, Receiver and Paymaster of the money for buying tin in Cornwall and Devon, 34, 223, 469. -, James, landcarriagewaiter at the Gates of Edinburgh, 102. -, John, tidewaiter at Dunbar, 507. -, [Roger], major general, regiment of Foot of, pay of, 255, 257, 259, 260, 339. Ellis, Richard, Surveyor of the duties on Houses for co. Leicester, 374, 375; same for co. Lincoln, 54, 374, 375. -, Sir William, a Commissioner to inquire into losses and damages caused by Rebels in co. Lincoln, 425. Ellison, John, petitioner to the House of Commons concerning unlawful fees imposed by the Auditors of Imprests, 103, 111. -, Ralph, Surveyor of Customs at Shields in Newcastle port, 577. -, Thomas, security for W. Cobb, 428. Elloe, co. Lincoln, wapentake of, Receiver General of Taxes for, 168. Elm, trees, in Greenwich Park, 208. Elm, Elmeleame, co. Cambridge, 350. Elmbridge, Emly Bridge, co. Surrey, hundred of, Receiver General of Taxes for, 167. Elphinstone, John, taking care of the Cotton Library, salary and allowances for, 335. -, -, Lord Elphinstone, annuity of, 195, 454, 540, 559. Elstob (Ellstoff), Lewis, Agent and Receiver General of Forfeited Estates in England, 357, 397. Elton, , [connected with Customs or the Navigation Act], attending the Treasury, 21, 22. -, Abraham, of Bristol, merchant, petition concerning the Constantine, 213, 219, 226. -, Jacob, of Bristol, merchant, petition concerning the Constantine, 213. Elwes, John, petition on behalf of his nephew Richard Page, a minor, 272. Elwill (Elwel, Elwell), Edmund, colonel, Comptroller of Excise, 4, 40, 94, 470, 492; attending the Treasury, 467. Ely, Isle of, Receiver General of Taxes. See Lightfoot, R.
Embly, , sergeant, of the Horse (Grenadiers, 304. Empson, William, clerk at the Treasury, 160, 301, 500, 615. Emsworth, co. Southampton, waiter and searcher and riding officer at, 61. Enfield Chase, co. Middlesex, wastes in, 161. Engineer, that built the Edistone, 234. Englefield, Sir Francis, holding fishing rights at Caversham Bridge, 426. English, Somerset, Underhousekeeper at Hampton Court Palace, 182, 419, 449, 483, 600. Engravers, 200, 615. See also King's Engraver. Epping Walk. See Waltham Forest. Equerries, to His Majesty, 252. Eriswell Marsh, Eastwell Marsh, co. Suffolk, 349. Ermington, co. Devon, hundred of, Receiver General of Taxes for, 166. Erpingham, co. Norfolk, hundred of, Receiver General of Taxes for, 167. Errand, Magdalen, a French refugee, pension for, 237. Erskine (Areskine, Ereskine), Alexander, former collector of Customs at Inverness, 372. -, Charles, 464; annuity or pension of, 195, 421, 460, 540, 559. -, David, Earl of Buchan, 464; annuity or pension of, 195, 421, 460, 540, 559. -, Lady [Dorothy], royal bounty for, 51. -, Frances, lately Countess of Mar, annuity for, 531; petition for a grant of a house in Whitehall, 585, 604; plea concerning forfeited lands, 359. -, -, daughter of Lady Frances, 359, 531. -, John, Earl of Mar, attainder of, 31n., 531, 585; [Forfeited lands of], 359. -, Sir John, estate in Scotland of, mine in, 44, 442, 537. Esch, Henry Vander, deputy to Inspector of Prosecutions [for Customs] in the Exchequer Court, 438, 491. Escot, Isaac, late Chaplain to Col. Labarthe's French Regiment, petition for half-pay, 151. Eslington, co. Northumberland, manor or lordship of, mortgage of, 210. Espine, Bachelier de l', pension for, 230. Essex, county of, coast of, riding officers to guard, surveyor of, 533. -, Receiver General of Taxes for. See Wroth, J. -, Sheriff of. See Blackburne, W.; Fetherston, Sir H.
-, smugglers discovered in, 134. Essex, Daniel, tenure of land at Gillingham, 381. Etherington, Walter, landsurveyor and searcher at Caithness, 505. Ethersie, Hugh, Surveyor of the duties on Houses for co. Essex, 53. Eton College, Provost and Fellows of, perpetuity of, 54, 460, 566. Eugene, Prince of Savoy, Convention Act with, for raising Imperial troops for the war in Catalonia, 284, 285; troops serving under, 153, 268, 270. Evans, Evan, D.D., going as minister to Philadelphia, passage money for, 144. -, Griffith, tidesman, superior list, London port, to be Surveyor at Greenwich, 174; tidesurveyor at Greenwich, 129. -, Richard, Doorkeeper of the Custom House, 204. -, [William], major general, regiment of Foot of, pay of, 262, 338. -, William, major general, regiment of Dragoons of (4th Hussars), going to Scotland, 72; in Ireland, pay of, 271. Everard, Robert, to be instructed in Customs affairs at the waterside, 138; landcarriageman, London port, 503. Eversfield, Charles, late Treasurer of the Ordnance, 461; debt of, 403; surety compounding his debt, 1, 65. Ewart, Alexander, tidewaiter at Prestonpans, dismissed, 507. Ewen (Ewin), John, tidewaiter at Dumfries, removed to be landcarriagewaiter at the Gates of Edinburgh, 99, 101. -, Robert, a King's waiter, London port, 477, 510, 597. -, -, Surveyor of the duties on Houses for London, 54. Exchange, bills of, brokerage on, 1%, 23; paying and re-drawing of, commission of % for, 3, 23. -, losses by, in remittances for the Army serving abroad, 325329. EXCHEQUER BILLS, circulating of (as by 7 Anne, c. 30, 9 Anne, c. 7, and 12 Anne, c. 11), allowance to the Bank of England for, 80, 177, 316, 389, 439, 497, 510. -, exchanged by the Bank of England, 98, 211, 389, 439, 533. -, for management of the duties on Houses, 97. -, interest on, 214, 251, 282, 316, 361, 390, 439, 497, 510. -,-, Paymasters of, clerks and incidents of, 66; issues for, 71, 81, 143, 214, 251, 390, 536; securities of, 62. See also Edwards, S.; Fletcher, T.; Jerman, G.; Low, C.; Stockwell, J. -, Office for, in Exchequer Receipt, 435, 588. -, remitted by Receiver General of Taxes, 79. -, to be lodged in hands of the Navy Treasurer, 23. -, uncancelled, interest on, 80, 177. -, valued above par, issues of, 31; care in, 361. -, Auditors, of Imprests. See Imprests; of Land Revenues. See Lands. -, Barons of, 79, 86, 100, 141, 189, 245, 478. -,-, Chief Baron, 85, 100, 110, 580. See also Bury, Sir T.; Dodd, Sir S.
-,-, decrees made by, 359, 422. -,-, fees of, tables of, public display of, 175. -,-, Fourth Baron. See Smith, J. -,-, Fifth Baron. See Simpson, Sir W.
-,-, salaries of, 227, 303, 350, 353, 580. -, bill exhibited in, 119. -, Chamberlains of, attending the Trial of the Pyx at the Exchequer, 424. -, Chancery records transcribed at, 64, 462, 557. -, decrees of, 119, 359, 377, 422. -, Deputy Chamberlains for joining tallies. See Leslie, G.; Smith, J. -, exonerations of taxes made by, 584. -, fees, tables of, public display of, 175. -, fines and amerciaments estreated into, 64, 342, 466. -, Foreign Apposer in, salary of, 64, 512, 563, 573. See also Masham, F. C.
-, Foreign Estreats in, Clerk of, fees of, 64, 466, 557. See also Cook, J. -, informations exhibited in, 491; noli prosequi to, 207. -, King's Remembrancer, accounts of Customs officers passed by, 120. -,-, Customs bonds delivered to, 593, 594. -,-, Deputy to, moneys held by, 487; reports by, 62, 299, 577. See also Harding, J. -,-, fees of, 120, 478. -,-, necessaries provided for Customs officers by, 120. -,-, Office of, in Inner Temple, Secondaries in, fees of, 462. See also Butler, F.; sworn clerks in, 533. -,-, petitions referred to, 299, 379. -,-, Queen Dowager's books, etc., delivered to, 411, 590. -,-, salary of, 63, 466, 566. -,-, securities examined by, 568, 577. -,-, stay of process by, 79, 112, 245, 429, 587. -,-, warrants to, 55, 62, 65, 79, 81, 09, 105, 112, 166, 191, 245, 247, 283, 299, 356, 397, 398, 409, 424, 429, 517, 577, 586, 587. -,-, See also Masham, Lord Samuel. -, leases, 115, 136, 214, 247, 364, 371, 379, 381, 425, 426, 427, 604, 608; in custodiam, 568. -, licence out of, 492. -, Lord Chief Baron. See Exchequer CourtBarons of. -, Lord High Treasurer, 308. See also Godolphin, S., Earl of Godolphin; Harley, R., Earl of Oxford. -, Lord Treasurer's Remembrancer, fees paid to, 478. -,-, Office of, clerks in, fees of, 557. Secondaries in, fees of, 64, 462, 557. See also Batley, C.; Taylor, J. -,-, salary of, 64, 466, 557. -,-, See also Thompson, L.
-, money from seized goods paid into, 299. -, necessaries delivered to, 136. 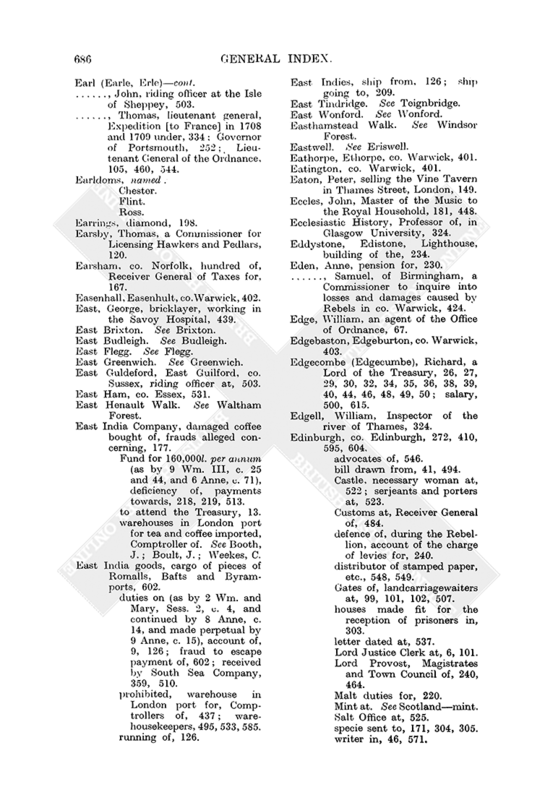 -, officers of, fees taken for passing sheriffs' accounts, 110, 141, 189. -, orders of, 209, 487, 492. -, Pipe, Clerk of, allowances of, 64, 466, 557; fees payable to, 541; warrants to, 59, 62, 89, 104, 107, 108, 109, 149, 188, 221, 247, 276, 277, 342, 349, 364, 371, 379, 381, 419, 425, 426, 427, 571, 604, 608. See also Cheyne, W., Lord Cheyne. -,-, Comptroller of, fee or salary of, 65, 463, 541, 569; warrant to, 59. See also Pottinger, J. -,-, Deputy Clerk of, certificates by, 148, 276, 334, 353, 394; particulars of lands and premises made out by, 149, 2778, 426. See also Neale, F.
-,-, Great Roll of, 276, 557, 572. -,-, Office of, fees paid at, 478; Post Office accounts passed at, 443; Recusants' records carried into, 466, 557; Secondaries in, fee or salary of, 65, 463, 541, 569; sworn clerks in, fees of, 541. -, Pleas, Clerk of, fee of, 64, 462, 558. See also Marriott, T.
-, records of Recusants' forfeitures kept in, 557. -, rules of, 86, 126; concerning duties on unrated East India goods, 9. -, seal of, 115, 214, 419, 424, 568. -, Solicitor for His Majesty's affairs in. See Harrison, C.
-, Usher, Chief Usher, of, allowance in lieu of debt, 136, 372, 587. 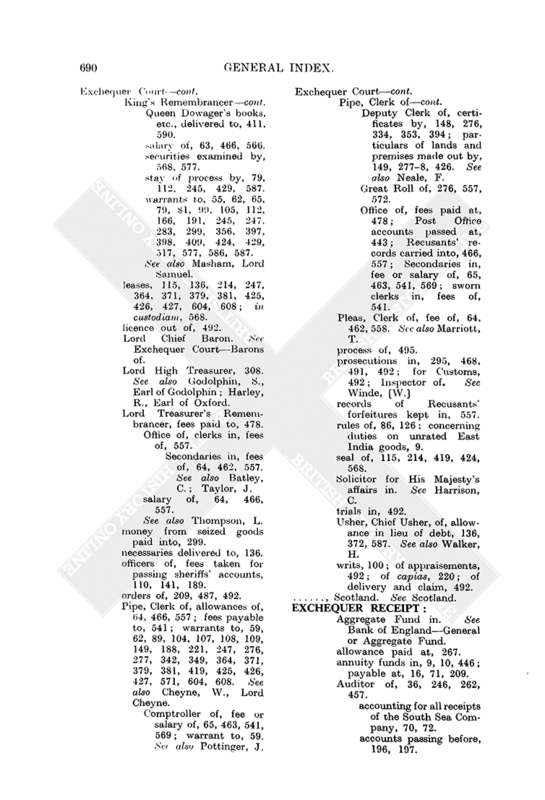 See also Walker, H.
-, writs, 100; of appraisements, 492; of capias, 220; of delivery and claim, 492. -, Aggregate Fund in. See Bank of EnglandGeneral or Aggregate Fund. -, allowance paid at, 267. -, annuity funds in, 9, 10, 446; payable at, 16, 71, 209. -, Auditor of, 36, 246, 262, 457. -,-, accounting for all receipts of the South Sea Company, 70, 72. -,-, accounts passing before, 196, 197. -,-, certificates by, 66, 80, 119, 171, 173, 179, 218, 316, 359, 477, 482, 510, 512. 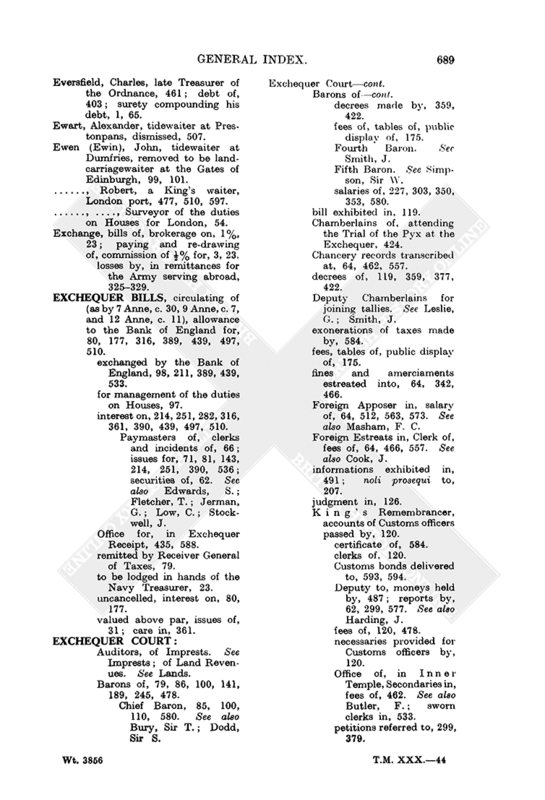 -,-, fees of, 197; tables of, public display of, 175. -,-, letters to, 30, 71, 145, 175, 243, 277, 352, 361, 434, 441, 495, 591. -,-, Office of, extraordinary service in, payments for, 160, 367, 500, 611, 615; Register of Public Loans in, 162, 298, 501, 610. -,-, petitions referred to, 191, 209, 244, 374, 468. -,-, salaries payable by, 59. -,-, warrants to, 59, 119, 205, 213, 289, 301, 307, 308, 439, 475, 496, 528. -,-, See also Montagu, G.; Earl of Halifax. -, Chancellor and Under-Treasurer of, 36, 282, 391, 475. -,-, attending the Treasury, 35, 36, 38, 39, 40. 44, 46, 48, 49, 50. -,-, fees paid to, 478. -,-, order signed by, 209. -,-, perquisites and profits of, allowance for, 66, 161, 301, 469, 500, 616. -,-, robes and vestments of, 66, 469. 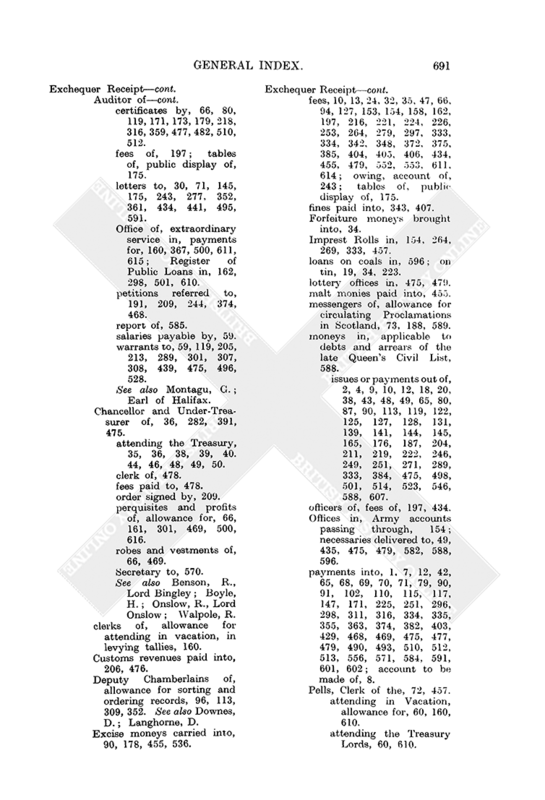 -,-, See also Benson, R., Lord Bingley; Boyle, H.; Onslow, R., Lord Onslow; Walpole, R.
-, clerks of, allowance for attending in vacation, in levying tallies, 160. -, Customs revenues paid into, 206, 476. 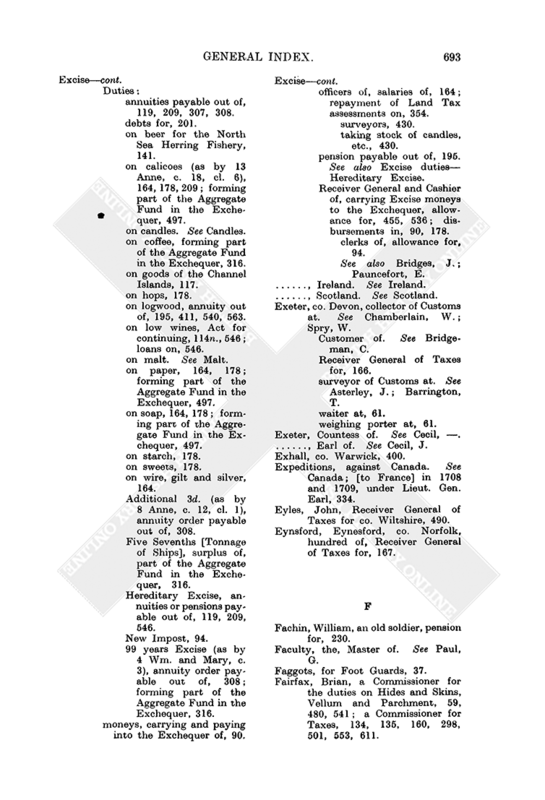 -, Deputy Chamberlains of, allowance for sorting and ordering records, 96, 113, 309, 352. See also Downes, D.; Langhorne, D.
-, Excise moneys carried into, 90, 178, 455, 536. -, fees, 10, 13, 24, 32, 35, 47, 66, 94, 127, 153, 154, 158, 162, 197, 216, 221, 224, 226, 253, 264, 279, 297, 333, 334, 342, 348, 372, 375, 385, 404, 405, 406, 434, 455, 479, 552, 553, 611, 614; owing, account of, 243; tables of, public display of, 175. -, fines paid into, 343, 407. -, Forfeiture moneys brought into, 34. -, Imprest Rolls in, 154, 264, 269, 333, 457. -, loans on coals in, 596; on tin, 19, 34, 223. -, lottery offices in, 475, 479. -, malt monies paid into, 455. -, messengers of, allowance for circulating Proclamations in Scotland, 73, 188, 589. -, moneys in, applicable to debts and arrears of the late Queen's Civil List, 588. -,-, issues or payments out of, 2, 4, 9, 10, 12, 18, 20, 38, 43, 48, 49, 65, 80, 87, 90, 113, 119, 122, 125, 127, 128, 131, 139, 141, 144, 145, 165, 176, 187, 204, 211, 219, 222, 246, 249, 251, 271, 289, 333, 384, 475, 498, 501, 514, 523, 546, 588, 607. -, officers of, fees of, 197, 434. -, Offices in, Army accounts passing through, 154; necessaries delivered to, 49, 435, 475, 479, 582, 588, 596. -, payments into, 1, 7, 12, 42, 65, 68, 69, 70, 71, 79, 90, 91, 102, 110, 115, 117, 147, 171, 225, 251, 296, 298, 311, 316, 334, 335, 355, 363, 374, 382, 403, 429, 468, 469, 475, 477, 479, 490, 493, 510, 512, 513, 556, 571, 584, 591, 601, 602; account to be made of, 8. -, Pells, Clerk of the, 72, 457. -,-, attending in Vacation, allowance for, 60, 160, 610. -,-, attending the Treasury Lords, 60, 610. -,-, clerk to. See Withers, T.
-,-, Deputy to. See Sadler, T.
-,-, fees of, 132; tables of, public display of, 175. -,-, locking up his Majesty's treasure, allowance for, 60, 610. -,-, warrants to, 119, 213, 301. -,-, See also Pelham, H.
-, pensions and annuities payable at, 16, 33, 71, 209, 230, 243, 244, 378, 495, 546, 568; issue for, 16. -, porter at the Exchequer Gate. See Milward, E.
-, salaries payable at, 200, 243, 317, 318, 346, 495, 568. -, salt monies in, payment into, 277; payments out of, 31, 364, 452, 476. -, tallies examined at, 192; struck at, 1, 94, 333, 353, 373, 405. -, Tally Court, officers and clerks of, fees of, 179, 479, 564; tallies levied in, 179, 554; tallies cancelled in, 179. -, Tally Joiner, fees to, 479. -, Tellers of (Four), accounts of, 65. -,-, fees of, 205; tables of, public display of, 175. -,-, first clerk to one of, 307. -,-, interest on Exchequer Bills paid to, 81, 214, 251, 536. 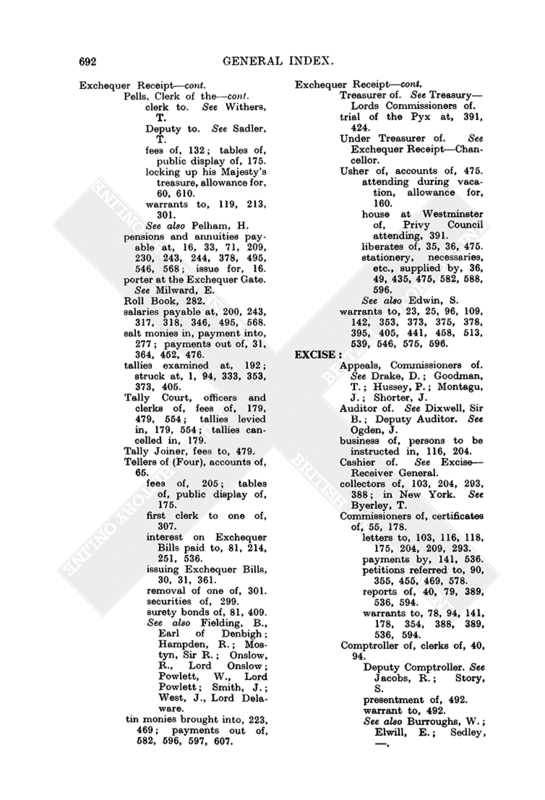 -,-, issuing Exchequer Bills, 30, 31, 361. -,-, removal of one of, 301. -,-, surety bonds of, 81, 409. -, tin monies brought into, 223, 469; payments out of, 682, 596, 597, 607. -, Treasurer of. See Treasury Lords Commissioners of. -, trial of the Pyx at, 391, 424. -, Under Treasurer of. See Exchequer ReceiptChancellor. -, Usher of, accounts of, 475. -,-, attending during vacation, allowance for, 160. -,-, house at Westminster of, Privy Council attending, 391. -,-, liberates of, 35, 36, 475. -,-, stationery, necessaries, etc., supplied by, 36, 49, 435, 475, 582, 588, 596. -,-, See also Edwin, S.
-, warrants to, 23, 25, 96, 109, 142, 353, 373, 375, 378, 395, 405, 441, 458, 513, 539, 546, 575, 596. -, Appeals, Commissioners of. See Drake, D.; Goodman, T.; Hussey, P.; Montagu, J.; Shorter, J. -, Auditor of. See Dixwell, Sir B.; Deputy Auditor. See Ogden, J. -, business of, persons to be instructed in, 116, 204. -, Cashier of. See Excise Receiver General. -, collectors of, 103, 204, 293, 388; in New York. See Byerley, T.
-, Commissioners of, certificates of, 55, 178. -,-, letters to, 103, 116, 118, 175, 204, 209, 293. -,-, payments by, 141, 536. -,-, petitions referred to, 90, 355, 455, 469, 578. -,-, reports of, 40, 79, 389, 536, 594. -,-, warrants to, 78, 94, 141, 178, 354, 388, 389, 536, 594. -, Comptroller of, clerks of, 40, 94. -,-, Deputy Comptroller. See Jacobs, R.; Story, S.
-,-, annuities payable out of, 119, 209, 307, 308. -,-, on beer for the North Sea Herring Fishery, 141. -,-, on calicoes (as by 13 Anne, c. 18, cl. 6), 164, 178,209; forming part of the Aggregate Fund in the Exchequer, 497. -,-, on candles. See Candles. -,-, on coffee, forming part of the Aggregate Fund in the Exchequer, 316. -,-, on goods of the Channel Islands, 117. -,-, on logwood, annuity out of, 195, 411, 540, 563. -,-, on low wines, Act for continuing, 114n., 546; loans on, 546. -,-, on malt. See Malt. -,-, on paper, 164, 178; forming part of the Aggregate Fund in the Exchequer, 497. -,-, on soap, 164, 178; forming part of the Aggregate Fund in the Exchequer, 497. -,-, on wire, gilt and silver, 164. -,-, Additional 3d. (as by 8 Anne, c. 12, cl. 1), annuity order payable out of, 308. -,-, Five Sevenths [Tonnage of Ships], surplus of, part of the Aggregate Fund in the Exchequer, 316. -,-, Hereditary Excise, annuities or pensions payable out of, 119, 209, 546. -,-, 99 years Excise (as by 4 Wm. and Mary, c. 3), annuity order payable out of, 308; forming part of the Aggregate Fund in the Exchequer, 316. -, moneys, carrying and paying into the Exchequer of, 90. -, officers of, salaries of, 164; repayment of Land Tax assessments on, 354. -,-, taking stock of candles, etc., 430. -, pension payable out of, 195. See also Excise dutiesHereditary Excise. -, Receiver General and Cashier of, carrying Excise moneys to the Exchequer, allowance for, 455, 536; disbursements in, 90, 178. -,-, clerks of, allowance for, 94. -,-, See also Bridges, J.; Pauncefort, E.
Exeter, co. Devon, collector of Customs at. See Chamberlain, W.; Spry, W.
-, Customer of. See Bridgeman, C.
-, Receiver General of Taxes for, 166. -, surveyor of Customs at. See Asterley, J.; Barrington, T.
-, weighing porter at, 61. Exeter, Countess of. See Cecil, . -, Earl of. See Cecil, J.
Expeditions, against Canada. See Canada; [to France] in 1708 and 1709, under Lieut. Gen. Earl, 334. Eyles, John, Receiver General of Taxes for co. Wiltshire, 490. Eynsford, Eynesford, co. Norfolk, hundred of, Receiver General of Taxes for, 167.